The aroma is fresh camporaceous and slightly resembles flowering tansy and dalmation sage. The sweet low notes resemble bitter fennel.It is excellent for blending with pines, citrus and rosemary. The health benefits of Thuja Essential Oil can be attributed to its properties like anti rheumatic, astringent, diuretic, emenagogue, expectorant, insect repellent, rubefacient, stimulant, tonic and vermifuge. Thuja is well known and very popular as a decorative plant. This does not mean that it is anyway less popular in the world of medicines. 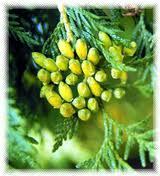 Thuja has a significant place in herbal and Homeopathic system of medicines. Even there is a medicine called Thuja in Homeopathy. Thuja can easily be seen in parks and domestic gardens and in most places where people try to decorate their surroundings with decorative plants. The scientific name of Thuja is Thuja Occidentalis and it is basically a coniferous tree, normally not very tall. Crushed Thuja leaves emit a pleasant smell which is somewhat like that of crushed Eucalyptus leaves, but more sweet. This smell comes from some of the components of its essential oil, predominantly some variants of thujone. The chief constituents of this oil are alpha pinene, alpha thujone, beta thujone, bornyl acetate, camphene, camphone, delta sabinene, fenchone and terpinenol. This essential oil is extracted by steam distillation of its leaves and branches. Its smell may be very pleasant, but it is important to note that one should avoid excess inhalation of this, since it can produce irritations in the respiratory tracts and nervous afflictions, since it is made of neuro toxic compounds. But that is covered by the other medicinal properties it has, given as follows. * Anti Rheumatic: There are to two main reasons responsible for rheumatism. First, deposition of uric acid in the muscles and joints and second, an improper and obstructed circulation of blood and lymph. Here, some properties of Thuja oil may prove remedial for these causes. First and foremost, it is a detoxifier by virtue of the diuretic properties it possesses. Due to its diuretic property, it increases urination and thus speeds up the removal of the toxic and unwanted substances such as excess water, salts and uric acid etc. from the body through urine. Second contributor is its stimulant property. Being a stimulant, it stimulates flow of blood and lymph and improves circulation. This brings warmth to the affected places as well as does not let uric acid accumulate at those places. Combined together, these properties give relief from rheumatism, arthritis and gout. * Astringent: Astringent is a substance which can make muscles (tissues), nerves and even blood vessels contract or shrink and sometimes gives a cooling effect. Astringents, which are meant for external applications induce local contractions. One such example is the fluorides and few other compounds used in toothpastes. To have this effect of contraction on all the organs (internal or external) of the body, the astringent needs to be ingested so that it mixes with the blood stream and reach all the parts. Most of such astringents are herbal products, just as this Essential Oil of Thuja is. Now, what happens when it is ingested? It mixes with the blood and induces contractions in gums, muscles, skin and at the roots of hair which strengthens hold of gums on teeth, makes muscles firm and gives a lift to the skin, prevents hair fall and makes you feel fit and younger. Further, it makes the blood vessels to contract which can slow down or stop hemorrhage from torn or cut vessels. * Diuretic: The diuretic property makes this oil a detoxifier. It increases frequency and quantity of urination. This helps keep the body healthy and free of diseases as it removes unwanted water, salts and toxins like uric acid, fats, pollutants and even microbes from the body. It helps cure diseases like rheumatism, arthritis, boils, moles, acne etc. which are caused by accumulation of these toxins. Then it helps reduce weight by removing water and fat and helps get rid of problems of swelling, edema etc. Further, the calcium and other deposits in the kidneys and urinary bladder are washed away with the urine. This prevents formation of stones and renal calculi. * Emenagogue: This property is very helpful for women. It gives them relief from obstructed menses as well as from the abdominal pain, cramps, nausea, fatigue etc. associated with the periods. It also makes periods regular and keeps the female reproductive organs in good health by promoting secretion of certain hormones like estrogen and progesterone. * Expectorant: One needs an expectorant for expelling phlegm and catarrh deposited in the respiratory tracts and lungs. This essential oil is an expectorant. It gives you clear chests, helps you breathe easily, clears congestion and gives relief from coughs. * Insect Repellent: The toxicity of this oil can kill insects and keeps them away from households. This is as true for parasitic insects like mosquitoes, lice, ticks, fleas, bed bugs etc. as it is for other insects found in households like cockroaches, ants, white ants, moths etc. This oil can replace those costly synthetic chemicals in the mosquito and cockroach repellent sprays, fumigants, vaporizers etc. * Rubefacient: This is another outcome of the irritant property of this oil which again comes from its stimulating properties. This oil produces very mild irritation on the skin and stimulates circulation of blood below the skin, which added together, makes the skin look red. Since it is more visible on the face, this property is called rubefacient, meaning “Red Face”, property. This, besides making you look vibrant, helps in the regeneration and rejuvenation of the skin due to increased circulation. * Stimulant: Besides stimulating blood circulation, it stimulates secretion of hormones, enzymes, gastric juices, acids and bile etc. as well as stimulates peristaltic motion, nerves, heart and the brain. Further, it stimulates regeneration of growth cells, erythrocytes, leucocytes and platelets. This means, it stimulates the whole body which leads to more activeness and alertness and a faster metabolism which gives a better growth and protection against diseases. * Tonic: The Essential Oil of Thuja tones and fortifies and is therefore a tonic. It tones up all the functions in the body. It tones up the metabolic functions like anabolism and catabolism and tones up the liver, stomach and intestines, thus helping in growth. It also tones up the excretory, endocrinal and nervous systems operating in the body and ensures proper excretion; promotes the endocrinal secretions of hormones and enzymes and keeps you more alert and active. Last but not the least; it tones up the immune system, protecting you from infections. And you know, a toned mind lives in a toned body. * Vermifuge: The toxicity of Thuja Essential Oil, due presence of Thujone, kills the worms in the body. It can eliminate worms like round worms, tape worms and hook worms residing in the body. * Other Benefits: It can be used to treat coughs, cystitis and warts, moles and other eruptions, abnormal cellular growths, some forms of skin cancers and polyps etc. Few Words of Caution: This oil is toxic, abortifacient and irritant for digestive, urinary and reproductive system and can produce nervous afflictions and convulsions when taken in overdose since the component Thujone present in its essential oil is a potent neurotoxin. It should not be given to pregnant ladies. Blending: Thuja Essential Oil blends well with essential oils of cedar wood, neroli, geranium, tangerine, mandarin, lavender and pine needle.